Is honey the best Ayurvedic Cough Syrup? Is Honey the best Ayurvedic Cough Syrup ? It is hard to perform or do your daily tasks once you find yourself sick with a cough. It is a discomfort that may cause difficulty in breathing and chest pains. In worse case scenarios, you may find yourself having a hard time sleeping. If you know some cough home remedy, it may come in handy in relieving yourself of this. 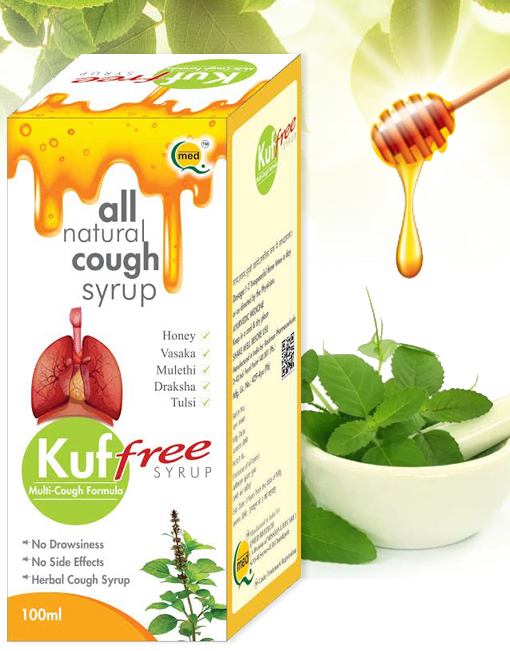 Since coughing is a illness commonly experienced by humans, it is not hard to treat it. You can find so many treatment for cough. And you don’t really need to cook or mix out-of-this world herbs and oils. You can treat yourself by turning ordinary kitchen items into home remedy for cough. To cough is the body’s method to flush out foreign material (or mucus) from the lungs and throat. It is mostly caused by the inflammation of the pharynx, smoking, allergens such as dust, smoke, pollen grains and chemical fumes, asthma, and weather changes. Coughs are generally categorized into two types: acute and chronic. Acute cough can last for about 2 weeks while chronic coughing lasts longer. General symptoms of coughing may include fever, chills, body aches, sore throat, nausea, headache, sinus pressure, runny nose, postnasal drips, and wheezing. In some occasions, coughing can be a sign of an underlying medical problem. If you find yourself coughing consistently and your cough treatment seemed ineffective, you might want to seek for medical help for medication. It might be a symptom of something more severe than what you are currently experiencing. For verification, schedule an appointment with a doctor for other treatments aside from your reliable home remedy for cough. One you are examined by the doctor and have cleared your condition, you may seek for his advice also on the best home remedy for cough. Here is a short list of the best home remedies that you can find in your kitchen: ? Onion is a very helpful cough treatment. Take 1-2 teaspoons of onion juice and add 1-2 teaspoons of honey. Take it at least 2 times a day. You can also try a homemade cough syrup made with onion juice, lemon juice and honey. Mix 1-2 teaspoons of onion juice with 1-2 teaspoons of lemon juice. Pour a little amount of water and boil. After, add 2 teaspoons of honey. You can also make tea. Add a little piece of ginger cut in small slices, 1-2 garlic seeds and a small amount of lemon juice. Mix in with water in a saucepan and let it boil for about 15 to 20 minutes. Add a little honey. Avoid cold foods. These can worsen the throat further. Always drink warm water. It will provide relief to your throat. Avoid any fruits and vegetables that may cause too much cooling in your body. Do not eat cucumbers, green bananas, papayas as well as watermelons. Avoid nuts since these have high oil content. Most importantly, ingest proper balanced diet, avoid mutton, caffeine, any type of oily and spicy food, sugar, and chocolates. Avoid cold drinks and ice cream if you want your cough home remedy to be effective. I apcirpeate you taking to time to contribute That’s very helpful. Stay ineaimotrvf, San Diego, yeah boy! This is an cool blog over here. I think I will visit your site more when u post more of this kind of specific information. Thanks a lot for posting this information. Would you like to easily see a birds eye view of what your current and past customers think about you? Do you know what people are saying about you? Whether its hurting or helping your business? My name is Paul, the Outreach Director of Five Star Fast Lane, and for the price of, well, nothing –I would like to provide you with a full detailed report on your current business standings. As a bonus, our report scanner will report back with any inaccuracies about your business that are out there potentially causing you loss of revenue and customers. PS – If you want to discuss the results we are available via live chat daily on the site.